Rochefort: the Hermione is ready for boarding! Home » Discover Atlantic Cognac through our main themes » Rochefort: the Hermione is ready for boarding! Rochefort loves the sea and ocean voyages, and it offers an array of impressive sites which are definitely on our list of must-sees. The Hermione is a familiar name. We’d followed its American odyssey in the media, and today we’re off to see it in real life. After its Grand Journey to the United States in 2015, in 2018 the frigate set a course for the Mediterranean, and we’re going to enjoy its return to its birthplace and home port, Rochefort. The famous three-mast sailboat faces us in the centre of the dockyard, just steps away from the Royal Ropery. 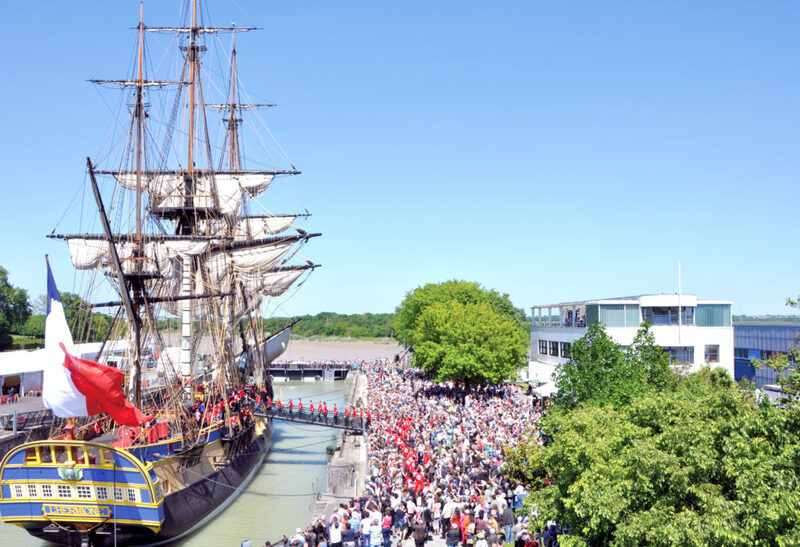 This impressive vessel is a replica of the frigate that took La Fayette and his men to the scene of the American Revolution. The exhibitions and workshops and the tour of this old sailboat, guided by a passionate boatswain, are fascinating. We discover all of the secrets behind the frigate’s adventures, as well as the boat’s hidden depths – the canteen, the cannon area and the sailors’ berths. The visit had given us a taste for adventure, and we couldn’t resist trying our hand at being boatswains by climbing the rigging at the Accro-Mats, a fantastic adventure park built in the shape of a dry dock. After zooming down the zip lines and climbing the rigging and masts, the view over the Hermione, the Charente River and the town of Rochefort from 30 metres up was incredible!